Bryan Jones is a planner and engineer, a Principal with Alta Planning + Design and the Founder of the popular Transportation Psychologist Facebook page. Today, he shares a guest essay about the need for design professionals to reframe their thinking about speed and begin building streets that are safe for everyone. Are we being precise, yet aiming at the wrong target when it comes to posted speed limits? Or are we using the wrong tool, research, or approach when identifying the appropriate posted speed limit, especially when it comes to safety for all roadway users in our communities? I find it deeply alarming that it's 2017 and approximately 40,000 people died on our roadways last year — the highest number of traffic fatalities in the US in the last two decades. This shouldn’t be news to anyone, though; we highlight these fatalities and severe injury collisions on the evening television news almost nightly, and you can see and hear emergency vehicles speeding toward carnage on our roadways on a daily basis. We often call these “accidents” so we can feel better about them or complacent about them. However, a majority of the severe injury and fatal collisions are preventable, so they are not accidents, and we cannot neglect this. What is your state or city doing to address this safety issue and prevent severe injuries and fatalities? Speeding — defined as traveling too fast for conditions or in excess of the posted speed limits — contributes to nearly one-third of all roadway fatalities. This proportion has remained largely unchanged for decades. High speed kills when it comes to vehicle speeds and low speed kills when it comes to addressing the issue of speeding and public safety. We need a sense of urgency to both understanding why the number of fatalities is trending upward, and a sense of urgency to reduce the number of total fatalities. It is not good enough to lower the fatalities per million miles travelled because the total deaths could still be on the rise if the vehicle miles are increasing, too. While the rest of the United States is trending upwards with fatalities on their roadways, the Cities of San Francisco and New York, who both adopted Vision Zero Programs to eliminate fatalities, are trending downward, and in 2017, experienced their lowest number of traffic fatalities since 1915 and 1910 respectively. Safety is often what elected officials hear from their constituents as their #1 priority in their communities, yet many communities experience more fatalities on their roadways than as a result of violent crime. Are we addressing the right safety issues in our communities? Most fatal crashes are caused by one of three driver behaviors: driving under the influence, speeding, and not wearing a seat belt. The relationship between speed and crash risk depends on many factors. What we do know is that speeding increases the likelihood of being involved in a crash and the severity of injuries sustained in a crash. Drivers who exceed the posted speed limit or drive too fast for conditions are involved in nearly one-third of all fatal crashes, according to data from the Fatality Analysis Reporting System (FARS). Due to inconsistencies in police crash reporting, it is likely that the proportion of speeding-related traffic fatalities is actually much higher. Moreover, let’s not forget the hundreds of thousands of people who sustain incapacitating, life-altering injuries from motor vehicle crashes involving speeding. The higher the collision speed, the more serious the consequences in terms of injury and material damage. The total national economic cost of traffic crashes (2010) is estimated at $242 billion. We also know that speed increases the risk of serious or fatal injury for the most vulnerable users of the roadway — people walking and biking. A study by the Governors Highway Safety Association (GHSA) found that 720 bicyclists were killed and 45,000 bicyclists — 12,000 youth and 33,000 adults — were injured on US roadways in 2015. The GHSA also reports that the number of pedestrian fatalities in the United States increased by 25 percent from 2010 to 2015. According to a National Highway Traffic Safety Administration (NHTSA) report, there were 5,376 pedestrian fatalities as a result of traffic crashes in 2015. Unfortunately, the public is less aware of the risks of speeding compared with other risky driving behaviors. 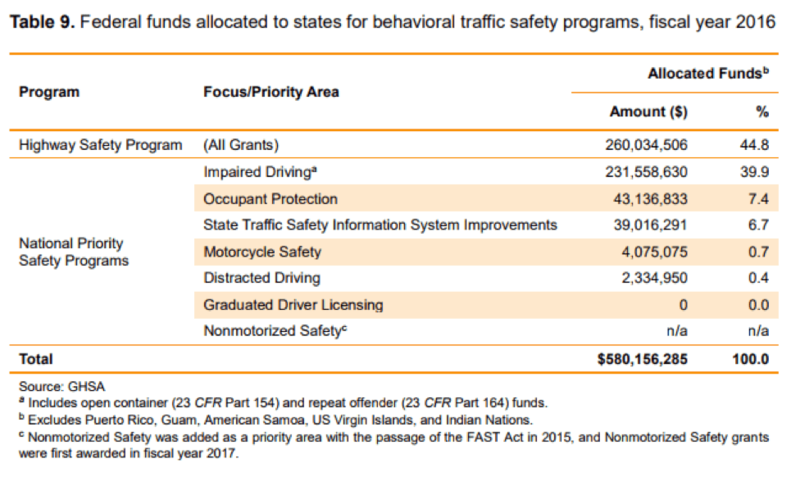 This is not a surprise considering that National Priority Safety Programs funds do not prioritize speeding. The table above shows how funds for these programs were allocated in fiscal year 2016. Why do we design streets within our communities where, when human beings make poor decisions or mistakes (speeding or driving impaired), the results are fatal? After all, we are all human and we all make poor decisions and mistakes sometimes. And often we do not consider the results of those decisions when we make them. 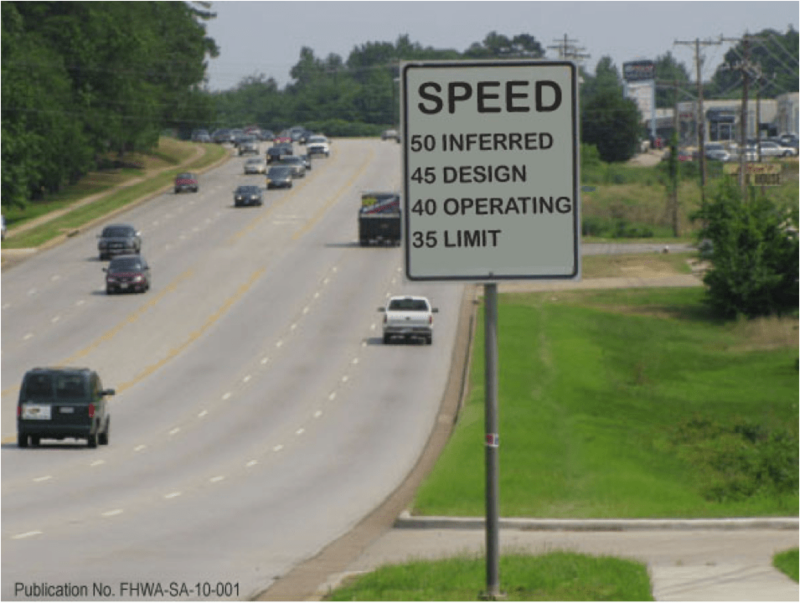 Speed limits are not necessarily known during the design process of a new road as they are determined after the roadway is built by evaluating how the motorists use the roadway. Before a new road is built, engineers choose a design speed to guide their decisions about the various geometric design features of the roadway. The geometric design criteria were developed in the 1940s. And for much of the time since, engineering practices have focused on moving cars quickly and efficiently. In other words, engineers value speed and volume over safety and cost. However, if you have attended one of Chuck Marohn’s Strong Town presentations, you will know that the public consistently values safety and cost far above speed and volume. In other words, the values for an engineering approach are upside down from what the public approach would be based on their values. Yet, we continue to design, advertise, and defend our engineering approach to setting speed limits established in the 1960s. Typically, speed limits are set by statute in a vehicle code and adjustments to statutory speed limits based on the observed operating speeds for each road segment — specifically, the 85th percentile speed of free-flowing traffic. 85th percentile speed, that by which 85 out of 100 motorists drive under good weather and visibility conditions, is considered the maximum safe speed for any given location. State and local transportation departments use the 85th percentile speed as the primary factor in setting speed limits. Neither the Federal Highway Administration nor the US Department of Transportation require the utilization of the 85th percentile for communities setting posted speed limits, and yet it is constantly used. More on that history in a moment. Many, if not most agencies, set posted speed limits by what 85 percent of the people (motorists) feel is comfortable and safe for the conditions of the roadway. This is often referred to as the “engineering approach” for setting speed limits. Then, those agencies concentrate enforcement on "irresponsible" driving above that posted speed limit. However, when these agencies recognize that 85 percent of people are driving faster than the posted speed limit (a frequent occurrence), they often choose to raise the limit so that more people will be in compliance and enforcement will be easier. In this way, raising the speed limit to match the 85th percentile speed may lead to even higher operating speeds and thus contribute to a cycle of speed escalation and reduced levels of safety. This leaves residents and elected officials in a conundrum because many people intuitively know that higher speeds have a direct correlation with both real and perceived safety on their roadways. One could even argue that motorists believe the posted speed limit is just the suggested maximum and more frequently treat it as the minimum, knowing that many law enforcement professionals and courts will not “strictly” enforce the maximum posted speed limit but rather something 9-15 MPH over the posted speed limit. A recent survey found that more than half of all driving time is spent at least 10 MPH over the legal limit, and 42 percent of surveyed drivers said they don’t consider going 10 mph over the speed limit to be speeding. Why not design a street to the desired maximum speed so it is truly the maximum speed? We as a transportation profession have that ability and all the tools and guidelines are in place; we just have to apply them differently in our approaches and practices. Raising speed limits to match the 85th percentile speed can result in unintended consequences. It may lead to higher operating speeds, and thus a higher 85th percentile speed. In general, there is not strong evidence that the 85th percentile speed within a given traffic flow equates to the speed with the lowest crash involvement rate for all road types. The “85th percentile rule” is based on a 1964 published study by David Solomon called "Accidents on Main Rural Highways Related to Speed, Driver, and Vehicle." The study looked at speed and crashes involving 10,000 drivers on 600 miles of rural highways. 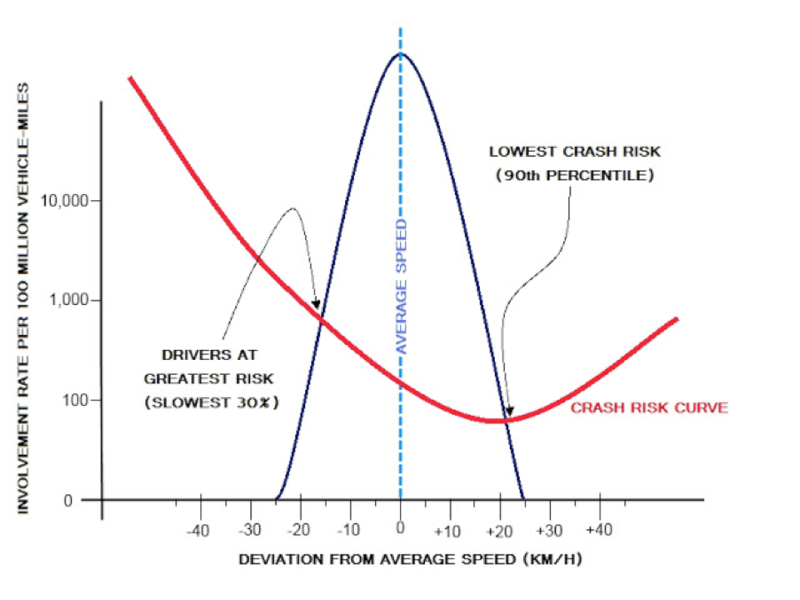 Solomon found a relationship between vehicle speed and crash incidence, illustrated by a U–shaped curve, and discovered that the likelihood of being involved in a crash increases with deviation from the mean speed of traffic on the facility. This U-shaped relationship, otherwise known as the Solomon curve, is the dominant factor in establishing speed limits in the US. Solomon reported that the results of his study showed that "low speed drivers are more likely to be involved in ‘accidents’ than relatively high-speed drivers." However, Solomon’s original research is dated, may not be valid under scrutiny, and was conducted on rural highways only, not streets with people in communities. So, are we as a transportation profession, law enforcement profession, legislative body, and judicial system not appropriately interpreting and applying research for which it was intended? Let’s think about this for a second, a rural highway has about as much in common with a city street as a tractor has with a minivan. Or put another way, if you needed brain surgery, would you go to a general practice physician or a neurosurgeon? The complexity of a street within a community has so many unique challenges and opportunities that rarely present themselves on rural highways. Yet, too often, we apply the same principles when it comes to speed on both rural and urban roadways. Alternative approaches for setting speed limits, which incorporate factors such as crash history and the presence of people walking and biking are available. While it’s perfectly reasonable to assume that uniformity of vehicle speeds reduces the risk of vehicle collisions on rural roadways, should the “85th percentile rule” remain the dominant factor in establishing speed limits on all streets and in all communities? If our goal is to build safe and productive communities, we must reconsider our approach to design speed and how we set speed limits, as they are both directly tied to speeding-related crashes. We must focus on designing streets that enhance safety for all roadway users and improve the livability, connectedness, health, prosperity, and access in our towns. Why not design streets that don't require police enforcement or ambulance visits and instead, have safety built right into them? Bryan Jones, PE, AICP is a Principal with Alta Planning + Design and the Founder of Transportation Psychologist. Alta’s mission is to create Active, Healthy Communities. Transportation Psychologist is a community on facebook that highlights the good, bad and ugly so that we can change the language, conversations and hopefully the culture of transportation. The goal is create great communities through transportation for people and businesses to thrive. There is often a gap in what we want and need and what we do. And we are all part of the solution! Bryan has also held leadership positions with the Cities of Carlsbad, Fremont and Fresno where he has inspired bold visions and big campaigns and aligned them with a strategic implementation plans that delivered numerous projects to enhance safety, livability and economy. Bryan is passionate about helping move and connect people and business so that communities can thrive. He strives to foster innovation and develop leadership so that we can move in the direction of our potential. He believes where challenges exist so do opportunities when we redefine the problem we are solving and bring a can-do approach and results-oriented focus. He also serves as a voting member of the California Traffic Control Devices Committee appointed by the State of California DOT to represent active transportation statewide as it pertains to standards, guidelines and policies in the California Manual for Uniform Traffic Control Devices. He received his civil engineering degree from UC Davis and his MPA from Norwich University.